Gustavson Column: Changes in store for a favorite vista? Perhaps it’s my age (68) or maybe it’s just the alignment of the stars, but I can’t seem to be able to write about anything this week other than the passage of time. Doctor, please take my temperature. I think there’s something wrong with me. I think I’m about to say something nice about, gulp, Cross Sound Ferry. Yes, the same Cross Sound Ferry I’ve spent years hectoring in this very space over unauthorized site plan expansion, burdensome vehicular traffic (scores of cars dumped onto two-lane Route 25, every daylight hour on the half hour) and other issues. 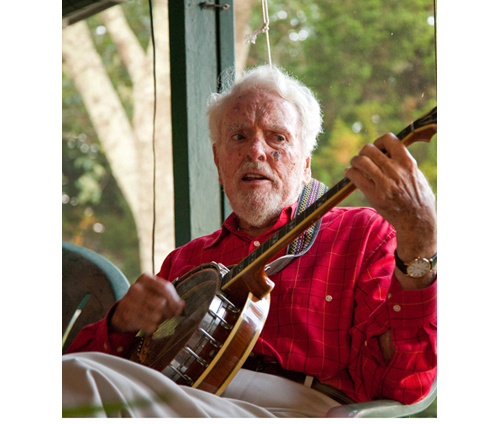 PIKE FAMILY COURTESY PHOTO | A recent photo of Otis Pike playing a banjo at a family party.